But I get no video output. Here are some pictures of my mod. DO you guys see anything weird? BTW I'm using a 9v 1200A negative centre Power Supply with an Everdrive cartridge. The everdrive cartridge seems to work as it has a led that turns on which tells me that the console is also on. Tried it on my projector as well and nothing. I have Famicom 3 boards, tried doing this mod in all 3 of them and nothing. I wonder if attaching the 150ohm resistor to the 5V line is riskier than attaching the 300ohm resistor according to console5's design. On one of my Famicom, running on a original Genesis AC adapter, I noticed that after a prolonged period of time, I would get some graphical corruption. Or is that related to a well known glitch related to pre-198x Famicoms? No, you'r not missing anything. I have just filled the empty holes because I think it looks better, nothing else. It "gets better" with copper foil. Make sure to solder for example a cut off component leg (or a wire) between the copper foil and ground. Copper foil does not remove all jailbars but it helps to reduce them. No need to remove the PPU if you'r careful when sliding the foil under the PPU. Sorry for not following up on this thread but IRL gets in the way unfortunately. I still want to make a tutorial for the newer Famicom motherboard but I have not had time. Regarding Jail Bars, it's a construction flaw in the hardware. Even the NES have them but less noticeably for the eye - but with an oscilloscope you can see them. The only way for a perfect image is the NesRGB kit. Hey guys, just wanted to ask some questions since the 2 famicoms I AV modded seem to have problems. The first one I did resulted in a perpetual pink screen, along with the rare occasional cyan and purple. The second one was more consistent though. A beige screen when nothing is plugged in, and a white screen when a game is plugged in. The game tested was 8BIT MUSIC POWER. Any ideas how I can fix these? Or what the problem is? Got a different game to try with or tried your game in a different working Famicom? A dirty or bad cart could cause blank screen. Alright! Got another cartridge and tested it out, perfectly working! 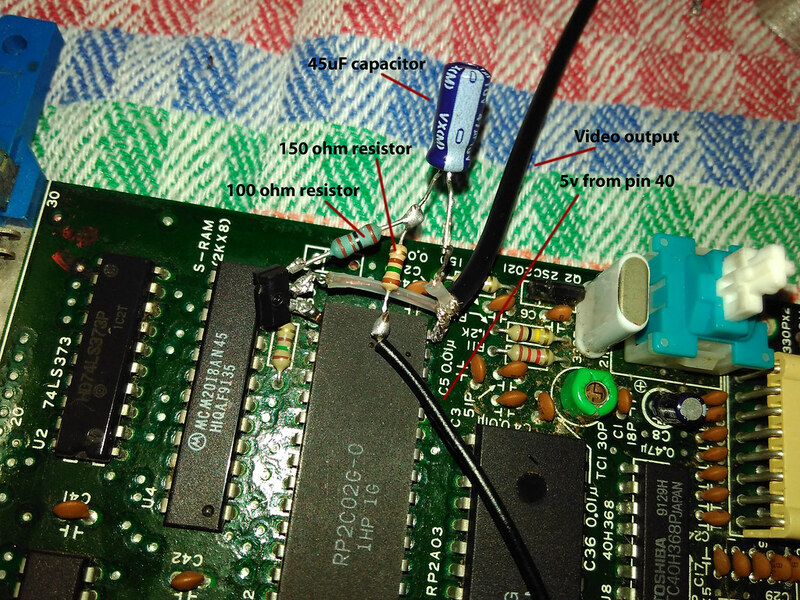 I tryed to do exactly same , exept i had only 220R resistor , but i think that not big deal. my RF board was not exatly same for sur. Rf board , i desolded all asked , but in some pics i can see some ppl didn t desolded all i did ?? I followed this tutorial but can only get a jumbled mess of pixels. The audio works fine but no picture. My soldering was a bit rough but it all has continuity. I didn't have a 120R resister so I used a 100R and 22R which should be fine. I'm in Australia so my TV is PAL but it does recognise NTSC devices. My soldering was a bit rough but it all has continuity. I didn't have a 120K resister so I used a 100k and 22k which should be fine. I'm in Australia so my TV is PAL but it does recognise NTSC devices. You used 100K and 22K? That's not the right values is it? Check it again. Sorry that was a typo, it is the correct value. Yeah I know, the holes it's meant to be soldered to are a bit wrecked but it's all along the same circuit. I've got proper value caps on the way, I just used ones I had laying around from a previous project. what about me ? do you see problem ? Sorry to reply to this thread a year later, but I'm having some issues getting the mod to work with my Famicom. I finished going through the instructions, and after initially booting a game, I found that audio works perfectly, but there's no video. I looked back over the instruction multiple times and am stuck as to what the problem might be. The only problem I could think of would be the black solder point i messed up on the power supply board. The reason why the capacitor is moved up a spot on the trace is because the actual trace peeled off of the original hole, so I just cut it off and moved it up a spot. It looks like the jumper you put in to replace R12 is not making contact on the top of the board (left side in picture). It also looks like the trace came off going from the left contact of the R12 spot to the emitter of Q1. From the pics, it looks like the whole trace came off the board, including the part for the through-hole, which is why the short is not making contact in the first place. No worries, it is fixable. 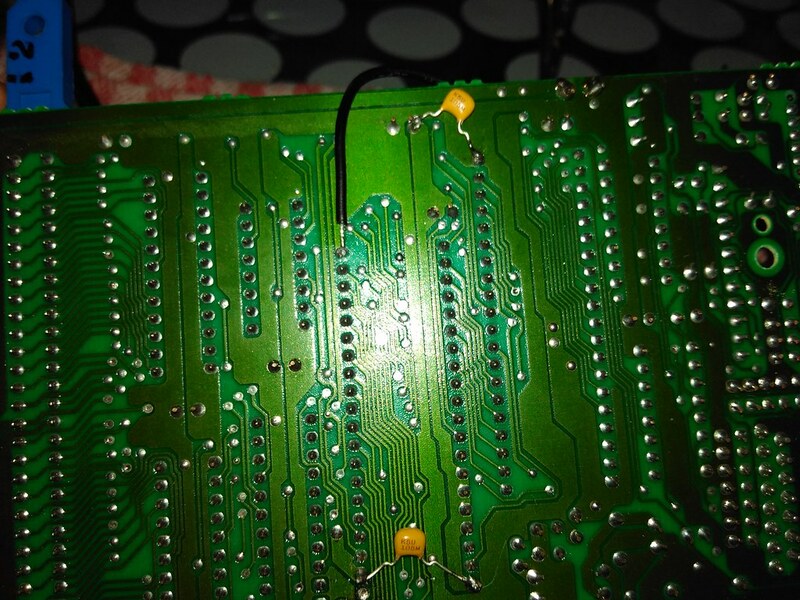 Turn the board around, and solder a jumper wire between the two spots circled red in the photo. That should fix it. I did this mod and it worked perfectly. Nice easy mod with no external circuits.